Jonah Lehrer’s post Basketball and Jazz at wired.com. A post which reviews research explaining the mental aspect of rebounding. In essence, Rebounding more than a learned skill is a rare skill. The implication is that it should sought and prized. Then you can follow up with Prof. Berri’s writeup of the piece: Rebounding is a Mental Skill . This is yet another brilliant piece highlighting the value of rebounding. We’ve been here before and old arguments die hard. I therefore decided in the interest of prevention to beta test a new feature we’ve been debating privately. The intent is to forestall some common arguments by putting together a nice compilation of some of the rich & varied material that has already been done in a particular vein in one place. Get ready for Argument Stoppers: Rebounds are Overrated rev.1. We start simple by quoting Pat Riley: “No Rebounds, No Rings”. “Yesterday’s piece was one of those pieces that just happen. I’d been working all weekend on some consulting work I need to hand in and when I went to write the Around the Wow piece the quote “oh the places you’ll go” popped into my head. Before I knew it, I was looking up Dr. Seuss books. This is fortuitous because two days ago I wrote a post on the 100 worst seasons/players since 1978. This inspired some familiar responses. The argument is diminishing returns for rebounding . Now the studies referred have some technical problems ( If you run a regression you must account for other variables that could affect your result). This is why you’ll see me control for small samples (minutes), age, position and teams frequently. Prof. Berri’s covered this before in the comments here http://dberri.wordpress.com/2010/05/01/ted-leonsis-endorses-stumbling-on-win or very thouroghly in Stumbling on Wins just buy the book). I’ve covered this before (see The Basics , and here ). In the book (which I recommend you buy :-)), the finding is that there is diminishing returns with respect to defensive rebound but not for for offensive rebounds. The overall though the effect is quite small. Therefore Wins Produced as a model is skewed and significantly overrates/underrates players. If this were a true statement then season to season fluctuation in Wins Produced would have to be huge and would make predicting the season a ridiculous exercersize (seriously, read any piece on this blog) and rebounding numbers would fluctuate wildly from season to season. 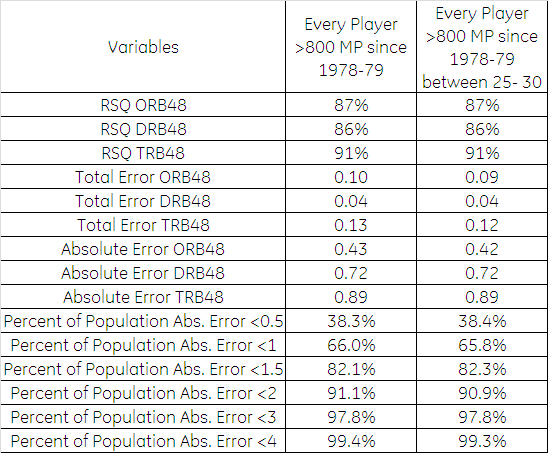 I pulled every players rebounding numbers from 1979 on (for every player with > 800 minutes played, see controls). And for Grins and giggles, looked at all players and a subset of player ages 25-30 (see more controls, this time for age). For your amusement that table is here. (This also allows for peer review of my findings). 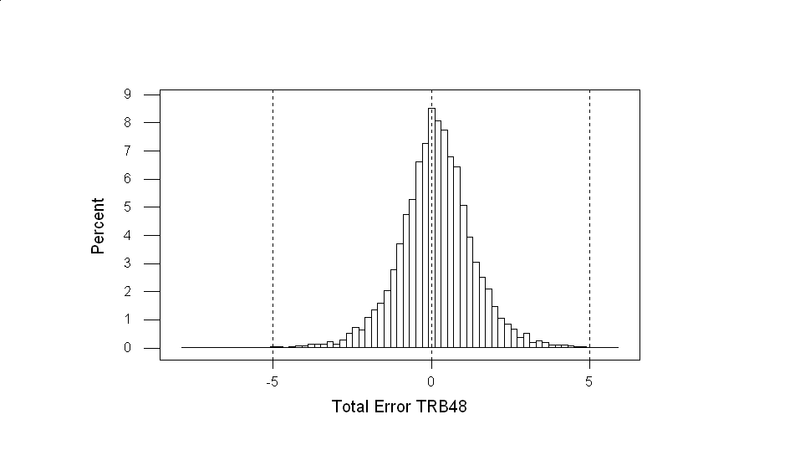 And that looks like the very definition of a normal distribution. Unnamed individuals pestered into writing additional material on this? Check and check (You’ll just have to wait to find out). Scott Meyer needs to get out of my head!!! You know, sometimes it’s fun to poke the bear. Did you know that when the bomb squad wants to defuse a bomb and they don’t know how to, they take it out to an empty field somewhere and blow it up? That’s kinda the opposite of what we do here. My defining trait is that I’m an engineer and a scientist. I don’t want to ignore questions and problems, I want to take a tool to it and try to solve or understand it. Yesterday’s post was a result of this. I knew I was kicking an anthill. Today is no different. Grab a drink, take a bathroom break, because this will take a while. One of the hallmarks of society is intelligent polite discussion. If any argument,tool or theory is worth anything it can stand up to scrutiny and review (such as Wins Produced see The Basics) . I may not agree with you but this is why I take the time to respond to the questions. I typically arrive at surprising and unexpected conclusions. The point of having a blog is to invite discourse. As long as everyone has a thick skin and is prepared to be wrong (and right ) , including me. We’ll keep advancing our understanding. Together. And you know in this case, Guy is right. Not like you think (sorry, couldn’t help myself 😉 ). We do have the data to answer some of these questions and some of the answers are really surprising. Before we get to that, lets talk a bit about linear regression. Predicting or forecasting Y (say Wins) based on a know set of X’s. This is something we continually do here at ASLS. Given a variable Y (say wins again) and a numbers of variables (say, I don’t know, points, def. rebounds, offensive rebounds, assists, etc.) then linear regression analysis can be applied to quantify the strength of the relationship between them. This is what Prof. Berri did. He did it again in Stumbling on Wins. I did it here and at least five other times. What does this mean for this discussion? I’m happy with the coefficients math gave me for rebounding and other variables, I’m not changing them. If I take out the best rebounder (by qty) for every team, I may not be getting the best rebounder by rate (per 48 minutes), however if I take out the best two rebounders on each team I get a surprising result. There is a positive relationship between the two best rebounders on each team. So having two good rebounders next to other increases returns (everyone else does see some mild dropoff at the extreme). Who knew? Phil Jackson knew that's who! Again fairly weaksauce correlation though. So the average rebound rate per 48 for teams without their best rebounder is 7.65. By my count 40% of the people on this list qualify.This concludes the rebounding portion of our program. Hmm. Fascinating. Playing with good players makes you a better player. 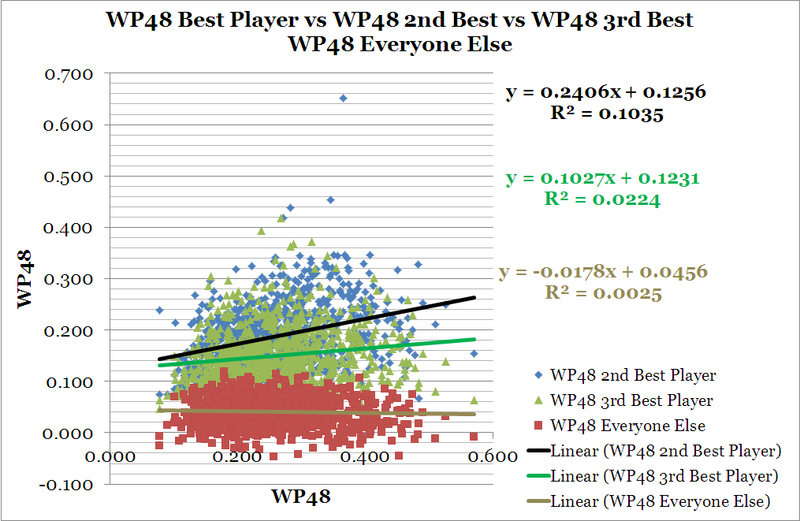 Instead of diminishing returns for WP48, we see increasing returns, and it holds for your top three. And it doesn’t affect the rest of the team that much. Again who knew? If you still feel that rebounding is being misrepresented (and have a few days to spend being entertained) go read Ben Morris’ Rodman Opus and don’t miss the bit about rebounding being undervalued. Drive safely and remember some things never change. I think you do a great job cranking out interesting content here. Isn’t part of the argument that assigning a value of 1 to the rebound is giving the rebounder credit for snagging the board PLUS all of the defense that created the missed shot? And that the position adjustment serves to do nothing but overfit the model to the win total? Also (changing subject slightly), how does Winshares look if you do the same comparison of best vs rest or best vs 2nd s 3rd that you did above for WP? says the poster named after a cartoon character. The points that merl brings up still give me pause. My Golden State Warriors (I know, I know…injuries, Biedrins, whatnot…but still) just make me feel bad and deeply, deeply confused about rebounding, defense and player interaction, numbers be damned ;). Great post Arturo. This is super random but could you turn your xkcd images into links to the original comic? One of the best parts of the comics is the mouse-over text, and when you just provide just the image, there is no easy way to find the comic on the site and see what the original mouse-over text was. I hover over the images as well from habit. Good call Rashad. Personally, I’m never going to be able to accept any study of rebounding that uses math alone because in every single NBA game I watch there are many instances of 2-3 defenders standing under the rim in position to get a rebound, but 1-2 defer. 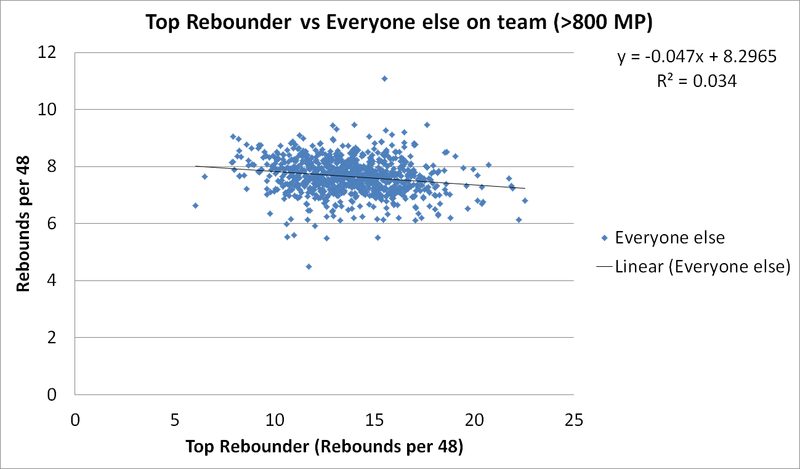 Without question, there is diminishing returns in rebounding. It’s just a matter of measuring it properly. IMO this combination has the effect of unjustifiably shifting a lot of value away from scorers and towards rebounders. It’s the exact opposite of the problem with PER where that measurement DOESN’T recognize the huge diminishing returns in scoring and probably overestimates it on the rebounding side (hence overvaluing scorers and underrating rebounders). The instances where 2-3 defenders are standing in position to get a rebound, but 1-2 defer would most likely be evenly distributed among teammates over time. If it isn’t evenly distributed, I would argue the better rebounders would more often be in the position of one of those 2-3 players to get that rebound. Basically they all probably eventually get their “fair” share of rebounds. If a player scores 30 points per 36 minutes at a TS% of 50% he gets approximately zero value for his scoring on the assumption that other players could easily take those shots and do at least as well. I have only a very minor problem with that at the extremes of usage. It’s fine. However, the model does NOT recognize that if you took out a player that gets 10 boards per 36 and replaced him with someone that gets 0, the team would not lose all 10 rebounds. The rest of the team would pick some of them up. The same would be true in reverse. If the model was tweaked to value defensive rebounds the same way it values scoring (call it .5 for a DREB or whatever), IMO the results would be more accurately reflect the values and a lot of the cases that intuitively seem way off and that attract a lot of attention from critics would vanish. I have a spreadsheet that approximates that (but without defensive adjustments). The results it produces are fairly close to WP, but many of those suspect cases evaporate. I think in doing that Dberri was just trying to keep the model simple, but I understand where you’re coming from, and I think that he should also release the WP numbers with the defensive rebound adjustment. At the same time though, I don’t think it’s as big as people make it. Only in the cases of extreme defensive rebounders is there an issue. Here’s the rub. Over the entire nba population there about 10 players that wins produced might grossly overated. On the otherhand there about 5 players that wins produced might grossly underrate. Why is there so much time being wasted on these players. Most of the all time greats are huge outliers via Wins Produced. The other methods have them much closer to the pack. Why can’t we discuss that more? Why are we always trying to defend WP as if it needs defending? WP is a tremendous weapon but it must be used properly. We might want to take a step back from some of its observations and consider other methods of evaluation. You might want to make sure that a guy who gets the bulk of his rating from defensive rebounds is in fact part of a great defense. If there is a divergence there. If a low efficiency scorer is the most efficient player on a team but is being punished by WP for bad shooting you might consider that hes not actually hurting his own team. Lastly, you might consider what would happen when a 4,5,6,7 option goes from a bad team to a really good team or vice-versa. 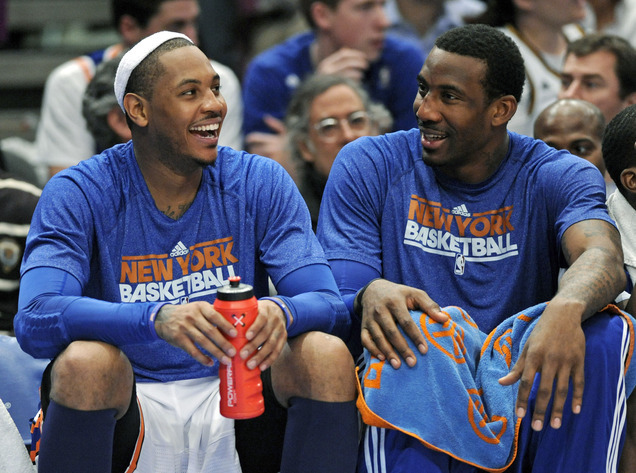 We know that 80% of team efficiency differential is produced by 3 guys. Therefore we know that alot of the ratings of the other players is derived from the top 3. In my experience if you’re weary of those 3 situations following WP will help have the clearest understanding of the game works. What specific methods are you espousing? marparker, Why worry about these ‘outliers’? Because if a simple fix to the formula (say 0.6 for DR and 0.1 to the other defenders on the floor) fixes it, why wouldn’t you do it? Why not make the player valuations as accurate as possible? Sure, most players aren’t grossly affected. But even minor differences across a career can tilt our view of players’ performance. And if we can more accurately view them through our statistical glasses, I think it helps us all understand the game better. If a low efficiency scorer is the most efficient player on a team but is being punished by WP for bad shooting you might consider that hes not actually hurting his own team. It seems to me that said team would still be losing, no matter who takes the shots. So I’m not sure how WP is unfair here. You’re right, a team with all below-average shooters will have a below average offense. But the 1st option shooting .550 shouldn’t be penalized more than the guy who only makes put-backs and shoots .570. There are teams that can overcome inefficient shooting with great defense. I believe that the primary argument against high-weight for rebounding is that we don’t know how to distribute the weights between rebounding and defense (e.g. 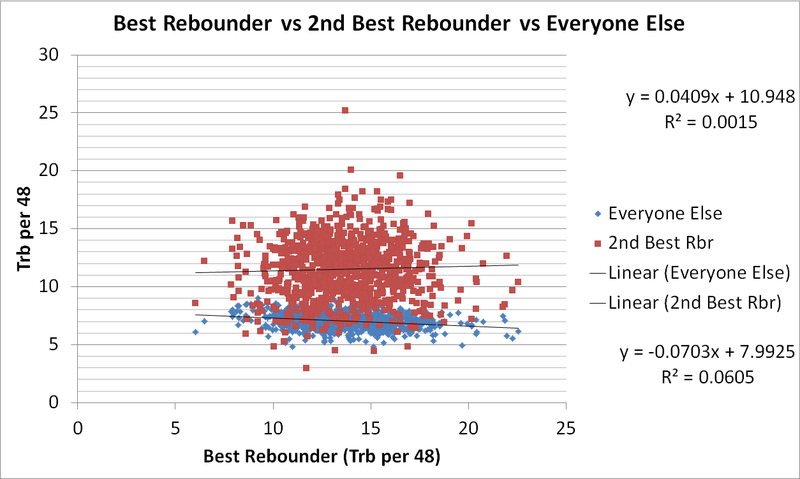 defensive rebounding could be highly correlated with defense). A player’s rebounding stat inherently encodes both that player’s rebounding ability and defense of the entire team. E.g., maybe Dennis Rodman was as good as WP48 indicates, but guys like Dejuan Blair (who struggles mightily defensively but is a very good offensive rebounder) may be less than what WP48 indicates. Defense is obviously difficult to capture but the way WP48 incorporates is pretty ad-hoc. I’d love to see what happens if Kevin Love leaves Minnesota and no other change is made. According to WP48, Minnesota is expected to win negative games, right? Of course this theoretical universe will never happen, but I’d bet a sizable amount that Minnesota can still record double-digit wins. Go check the FAQ for the DR conversion but in simple terms the win floor is about 9 out of 82 for an NBA team. Even at negative WP a team would bottom out around there. The further away from 41 wins the less linear the models are. I don’t see any indication that the ‘bottom’ is 9 wins. According to this table, if you replace Kevin Love minutes with, for instance, Dark Millic’s minutes, this team wouldn’t win a single game. Diminishing returns for wins produced certainly exists as is frequently noted in many posts and the books. 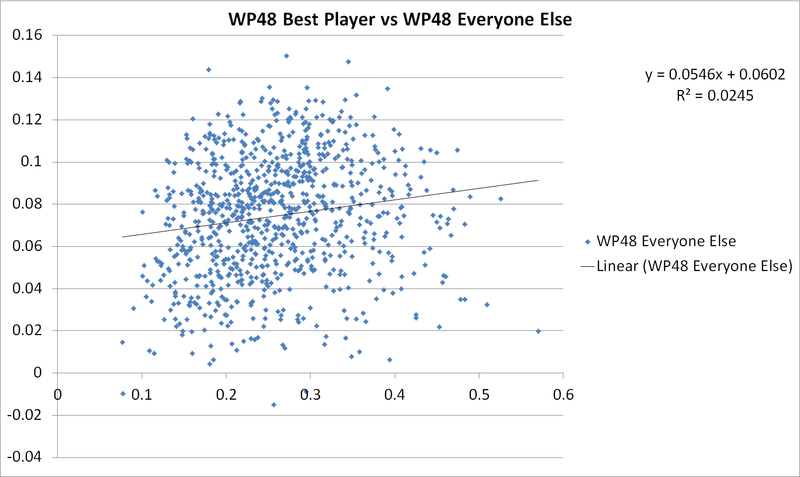 So from a wow perspective the scenario that you present isn’t a valid usage of wp48 since it ignores DR. I don’t have access to the book at the moment, someone want to look up what the measured impact is and whether any work’s been done yet relating specifically to negative producers? Wow — you didn’t even pause to consider that the Wolves (a terrible team) might be a below-average rebounding team without one of the best rebounders in the league. Maybe they’d have 417 rebounds below the average team — or thereabouts. TK: Sure I considered it. The rest of the Wolves may well be below average rebounders (and likely are). But 417 rebounds is huge: 100 per position, -5 rebounds per game, or about 13 losses just from bad rebounding. It’s possible, but not likely. But the key point is that this is part of a larger pattern: every great rebounder like Love has had teammates who were below-average rebounders (collectively). Every one. Arturo has tried many times to find counter-examples, but he can’t. And that can’t be a coincidence. If diminishing returns was only a small factor, there would be many great rebounders who were matched with average (or better) teammates. The fact that this doesn’t happen proves there is a very substantial diminishing returns factor at work. Please refer to the second half of the piece. Mike: Arturo’s arithmetic is wrong, because it ignores the number of rebound opportunities a team had. (He knows this, so I don’t know why he reposted that table.) Here’s how to check: just take any great rebounder and replace their rebounds with the average rebounds at that position. Give the rest to the opposing team, since WP assumes these rebounds were taken from the opposing team rather than teammates (that’s the whole point of this debate). Now see if the reconfigured team gets 50% or more of all rebounds when an average player replacies your great rebounder. If not, the teammates must be below average (less than 50%). Let’s take Rodman 1997, the best year for his teammates. Rodman had 462 rebounds above an average PF. Take those away, and now Chicago is 3275 rebounds in 6989 opportunities, or 219 rebounds below average. So Rodman’s teammates, paired with an average PF, would be -219, which means they were of course -219 rebounds. Put another way, while Rodman allegedly added 421 rebounds (above an average PF), the Bulls were only +201 rebounds overall. That’s quite good, of course, and Rodman almost certainly contributed most (maybe all) of those boards. But even with the great Rodman, we find that his teams only got about 40% of the extra rebounds that WP thinks he delivered. Table in the Middle titled Correlation to Win % Differential by Exponent. Arturo: I’ll wade through that article, if you will first acknowledge that the teammates of great rebounders are invariably below-average rebounders. Let’s agree on addition and subtraction before we tackle complex regressions. The study is indeed interesting. But I don’t see what it tells us about the value of rebounding in the NBA. The debate over rebounding boils down, as it always has, to one question: how much variation is there in rebounding skill within the NBA? The study shows very clearly that professional basketball players are much better than civilians at anticipating the outcome of shots. I imagine if they had tested their respective ability to shoot FTs or 3-pointers, the pros would have won those contests as well. But that tells us precisely nothing about how much this skill varies within the elite ranks, nor what those skill differences translate into in terms of actual rebounds. I don’t think anyone doubts that NBA players are better rebounders than civilians. Or that some NBA players are better rebounders than others. The question is “how much better?,” or (same question) “how scarce is rebounding skill?” And you are left with a mountain of unrefuted statistical evidence that rebounding skill is rather plentiful, which is why team rebounding rates don’t vary that much. If you want to reopen this debate — which is indeed settled everywhere except here — you need some new evidence on those key points. I don’t believe the model can be made “more accurate”. However every model is going to have outliers. I believe its then up to the observers to derive something to discern the meaning of it all. Defensive rebounds correlate to winning so much because so many great rebounders are also great at defending the basket. For my own purposes I penalize great rebounders who’s teams have bad def fg%. As an engineer, I had drilled into me the difference between ‘accurate’ and ‘precise’. So in this instance, yes, I do think it could become “more” accurate if it indeed does not as closely as possible match the true value of individual players’ worth to a team hoping to win a basketball game. Call it too detailed, but I for one would like to see, for instance, Jason Kidd get credit for managing to throw up a shot that finds the rim (at the shot clock) from which the Mavs got an OR. Certainly that’s worth more than a turnover? Please include permalinks to the original XKCD comics. The punchline is often in the alt text. From now on: permalinks free with every xkcd! I have a very simple question: Suppose you have 5 players for team A, all of which grabbed offensive rebounds 6% of the time when their offense missed a shot. Of the 5 players of team B, everyone grabbed 14% of the defensive rebounds. Suppose the two teams play against each other and team A misses a shot. We would then forecast team A to grab an offensive rebound 30% of the time right? Because 5*6= 30 and 5*14=70. It also means that team B grabs the rebound 70% of the time. All is well. Now team A substitutes and brings in a 7% offensive rebounder for a 6% one. Team B also substitutes and brings in a 15% defensive rebounder for a 14%. What would our forecast be now? You’d project something like 30.6 pct, because player oreb% is fairly good predictor of actual team impact, while dreb% tells you virtually nothing. Here’s a little ditty that I sing whenever the cherry-pickers start to post…Wins produced is about all the stats – la di da, can’t cherry pick just some of the stats, oh yeah! C’mon everybody! Wow. The level of analysis and debate on this site has really gotten impressive. Since rebounding is so critically important, why don’t you explain to us why the worst teams in the NBA rebounded just as well as the playoff teams this year. What is that picture supposed to tell us? @guy: why is it “something like X%”? Can’t we calculate the expected OReb% really easy from those numbers? Slave: your projection depends on your estimate of the impact those two new players will have on team rebounding skill. The best estimates I’ve seen would be something like .7 pct for the offensive player and .1 or .2 on defense. Have you seen (and answered) the points that I raised in the first post? I’m a little mystified that you are ignoring it. Sorry. Been a bit busy. The win shares point is interesting. I’d expect a similar result with ws flatter distribution. I’ll definitely put it on the queue.